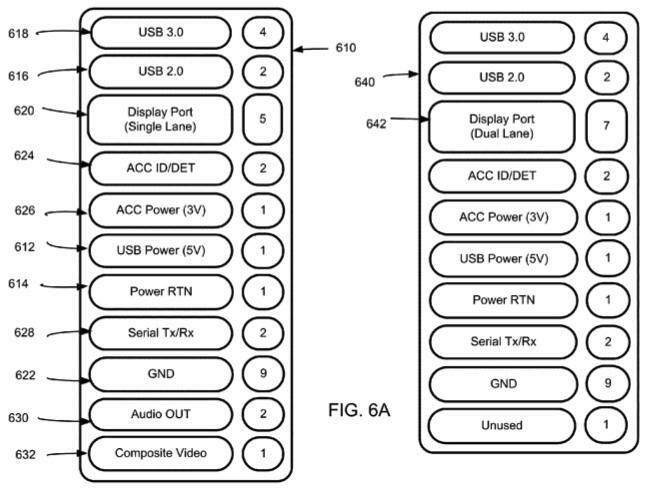 A patent recently granted to Apple reveals that the company is looking into a modified dock connector compatible with newer high-speed communication standards, such as USB 3.0 and a "dual-lane DisplayPort," or Thunderbolt, connector. The invention, entitled "Reduced Size Multi-Pin Male Plug Connector," was published by the U.S. Patent and Trademark Office on Tuesday and describes a smaller 30-pin dock connector with updated connection standards. "Some embodiments of the present invention can provide support for one or more new high-speed communication standards," the filing read, citing USB 3.0 and DisplayPort as examples of these standards. 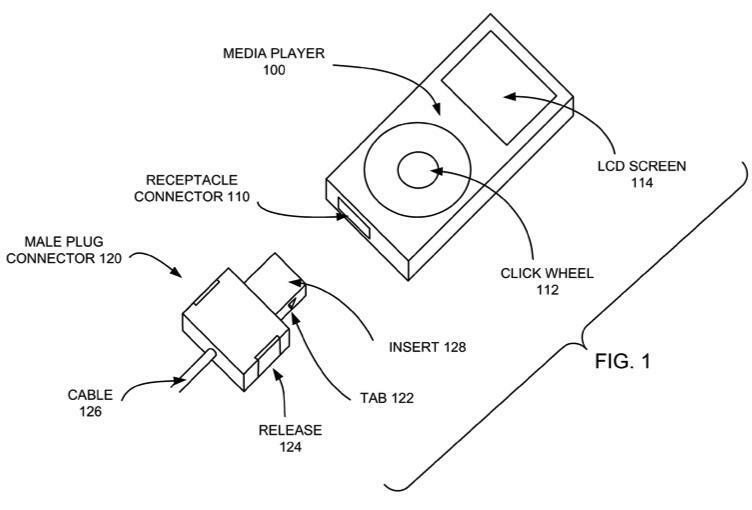 The device depicted in the application's drawings is an iPod, but the invention extends to other mobile devices and laptop and desktop computers. According to the patent, the multi-purpose connector could carry power, data, video and audio signals. One embodiment includes two legacy USB2 contacts, four USB3 contacts, USB power and a ground. The DisplayPort standard would transfer data at 1.3MP with one lane, 1.8MP with two lanes and 4.1MP when all four lanes are selected. 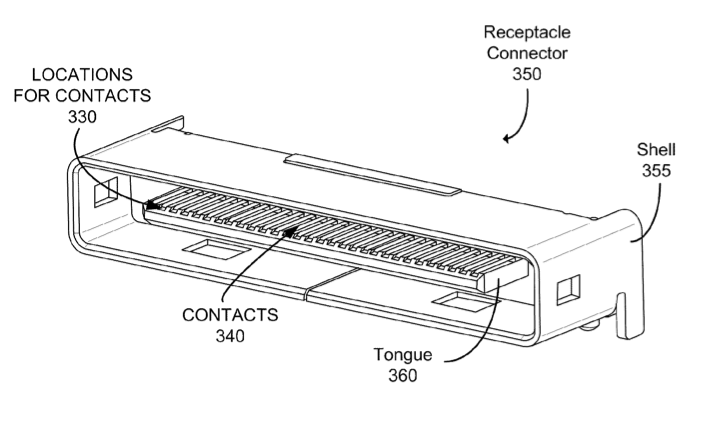 The patent does not indicate whether the new connector would be backward compatible with Apple's current dock connector. The invention is credited to Stephen Paul Zadesky, Brian S. Lynch and Jason Sloey. It was filed for on Sept. 29, 2009. Though the patent was revealed by the USPTO last year, Intel's Thunderbolt implementation, which couples a DisplayPort with high-speed interconnect, had yet to be announced. Intel announced the Thunderbolt interconnect technology in February alongside Apple's release of new MacBook Pros, the first to take advantage of the new specification. 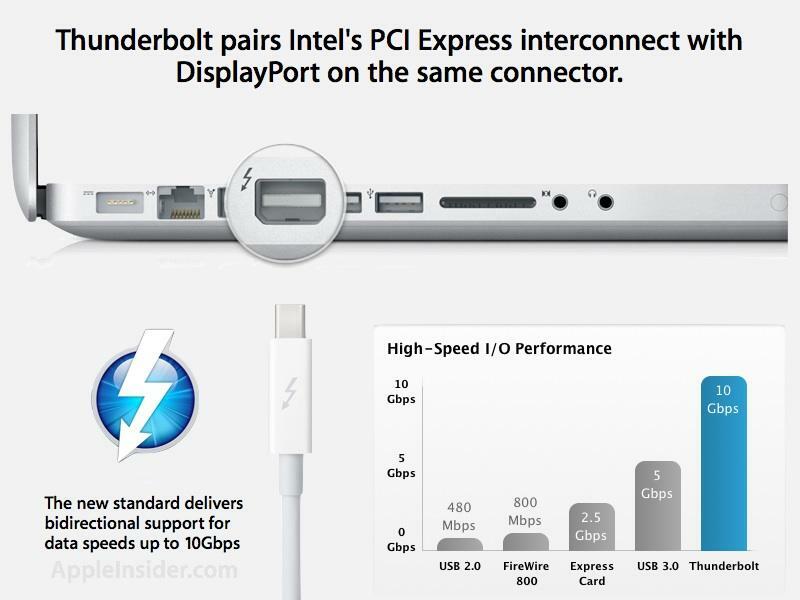 Formerly codenamed 'Light Peak,' the technology provides PCI Express interconnect speeds of up to 10Gbps and utilizes the Apple-developed Mini DisplayPort. Intel had originally hoped to use fiber-optic cabling for the technology, but initial implementations utilize copper wiring due to cost constraints.